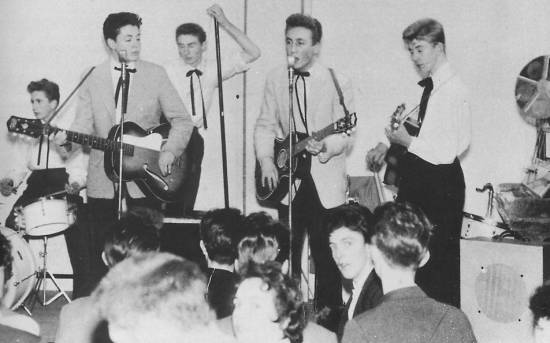 28 SECONDS OF HISTORY, LISTEN TO AN ACTUAL RECORDING OF THE QUARRYMEN FROM THE CONCERT PICTURED ABOVE! Lennon tried lessons but "decided it was going to take forever to play music properly", Hanton said. He only changed his mind after seeing skiffle king Lonnie Donegan, who proved anyone could play an instrument. Hanton told BBC World Service's The Music Biz programme: "It was just a school band really - I don't think any of us saw any great future in it, or great talent. 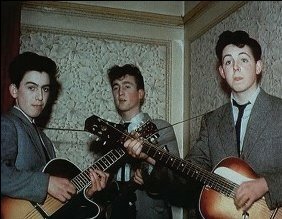 "Once Eric [Griffiths, guitarist] and John Lennon actually tried to learn to play guitar properly, they went to a music teacher for two lessons - and decided it was going to take forever to play music properly. But then Lonnie Donegan came on the scene and said 'all you need is three chords and something you can bang' - a rhythm section or whatever - so overnight everybody joined a skiffle group. They realised you didn't have to be particularly musical or talented, as long as you could keep a tune." 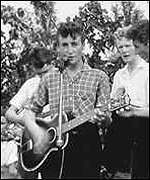 The Quarrymen were founded by Lennon with Griffiths and Pete Shotton at Quarry Bank School, Liverpool, in 1957. 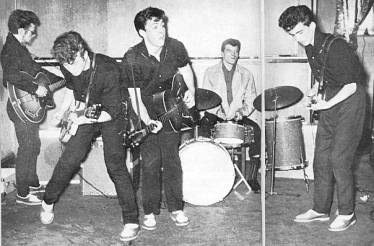 Paul McCartney joined them after watching them perform at a church fete, followed by George Harrison. Of the "great meeting" between Lennon and McCartney at the church fete, bassist Len Garry said: "We've all got different versions of this. "I remember Paul doing a Little Richard impersonation, and I said to John 'that's good - let's get him in.'" Banjo player Rod Davis said the fact McCartney could play guitar properly won his place in the group. "I was actually playing a banjo, so I was allowed to play banjo chords, but John and Eric played guitars tuned like banjos," he added. "When Paul turned up, he eventually taught them how to play guitar chords. That was a great improvement to the sound." But he admitted McCartney - who has said he secured his place in the line-up after playing a song called Twenty Flight Rock - "remembers better than us". "I don't think I was even there at the time," Davis added. "I must have gone for a pee. The greatest moment in rock 'n' roll history, and I missed it." Once McCartney and Harrison joined, the founding members began to drift away - leaving the core that briefly became Johnny and the Moondogs before changing to The Beatles. Hanton, Griffiths, banjo player Rod Davis and bassist Len Garry are now releasing their first studio album. Songs We Remember, featuring music they played when they first formed, has been released. The Quarrymen reformed for a one-off benefit gig in 1997, which was followed by a tour and a live album, but Songs We Remember is their first studio release. However, they did record a single in the late 1950s. A double A-side, it featured a cover of Buddy Holly's That'll Be The Day on one side and a song written by Harrison and McCartney, In Spite Of All The Danger, on the other. The tracks survive, and recently re-emerged on the Beatles Anthology.